Are you looking for a study guide on Aerosol Drug Therapy? If so, then this is the post for you. The practice questions found here cover everything you need to know for Egan’s Chapter 39 (from the 11th Edition) in order to ace your exams. Are you ready to get started? Then let’s go ahead and dive right in! 1. What does the aerosol particle size depend on? It depends on the substance being nebulized, the method used to generate the aerosol, and the environmental conditions surrounding the particle. 2. How are medical aerosols generated in the clinical setting? They are generated with devices that physically disperse matter into small particles and suspend them in gas. 3. How does a large volume ultrasonic nebulizer work? It incorporates air blowers to carry mist to the patient for delivery of bland aerosol therapy or sputum induction. 4. How do ultrasonic nebulizers work? 5. How do you prime an MDI? Shake the device and release one or more sprays into the air when the MDI is new or hasn’t been used in a while. 6. How is Aerosol Output measured? By collecting the aerosol that leaves a nebulizer and collects on special filters. 7. How are DPIs categorized? They are categorized by the design of their dose containers. 8. How often do you assess a patient on continuous nebulization? 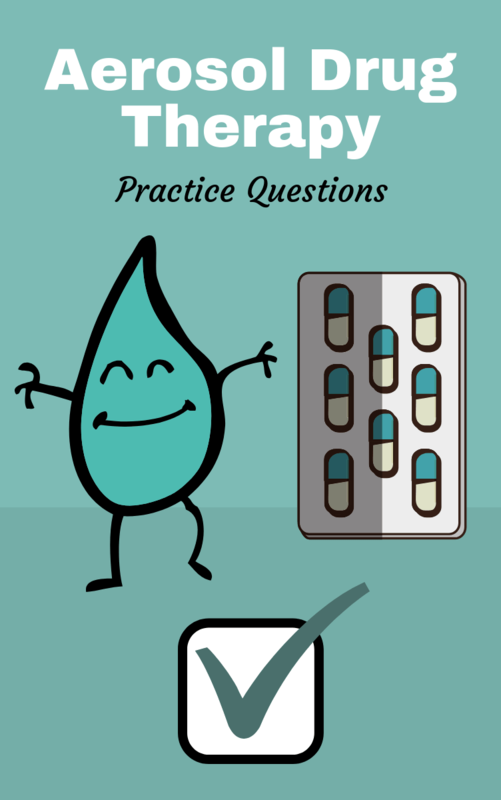 Assess them every 30 minutes for the first 2 hours then hourly after that for adverse drug responses. 9. What affects MDI performance and drug delivery? Low temperature decreases the output of the CFC MDI’s. Debris build up on nozzle or actuator orifice reduces the emitted dose. 10. What are 3 examples of aerosol devices? 11. What are 3 factors that determine particle size? The substance being nebulized, the method used, and the environmental conditions. 12. What are beneficial characteristics of using an MDI? They are portable, compact, and easy to use. 13. What are heterodispersed aerosols? They are aerosols with particles of different sizes. 14. What are key mechanisms of aerosol deposition? Inertial impaction, Gravimetric sedimentation, and Brownian diffusion. 15. What are the medication delivery issues for infants and children? They have smaller airway diameters, faster breathing rates, nose breathing filters out large particles, lower minute volumes, and spontaneous patient cooperation can be an issue. 16. What are monodispersed aerosols? Aerosols with particles of similar sizes. 17. What are small volume ultrasonic nebulizers used for? The delivery of aerosolized medications (i.e. bronchodilators, antibiotics and anti-inflammatory agents). 18. What are sub-hazards to aerosol drug therapy? Infection, airway reactivity, pulmonary and systemic effects of bland aerosols, drug concentration changes during nebulization, and eye irritation. 19. What are therapeutic aerosol depositions influenced by? The inspiratory flow rate, the flow pattern, respiratory Rate, inhaled volume, the I:E ratio, and breath-holding. 20. What are two methods to measure medical aerosol particle distribution? 21. What contributes to aging of aerosols? The composition of aerosol, the initial size of particles, the time in suspension, and the ambient condition. 22. What does gravimetric analysis measure? 23. What happens to the temperature of a solution placed in an ultrasonic nebulizer? 24. What is a dry powder inhaler (DPI)? It is a breath-actuated dosing system by which a patient creates the aerosol by drawing air through a dose of finely milled drug powder. The dispersion of powder into respirable particles depends on creation of turbulent flow in inhaler. 25. What is an aerosol emitted dose? The mass (amount) of the drug leaving the mouthpiece as an aerosol. 26. What is aerosol output? The mass (amount) of fluid or drug contained in an aerosol. 27. What is aerosol output rate? The mass (amount) of aerosol generated per unit of time. It varies depending on different nebulizers and inhalers used. 28. What is aging when pertaining to aerosols? The process by which the aerosol suspension changes over time. 29. What is a Metered-dose inhaler (MDI)? A pressurized canister containing the prescribed drug in a volatile propellant combined with surfactant and a dispersing agent. 30. What is an aerosol? A suspension of solid or liquid particles in a gas. 31. What is a positive response indicated from Continuous nebulization? An increase in peak flow of greater than 10% with a goal of at least 50%. 32. What is a technical downfall of MDIs? 80% of the aerosol hits the back of the throat depositing the medication in the oropharynx. 33. What is an ultrasonic nebulizer capable of? Higher aerosols outputs and higher aerosol densities than conventional jet nebulizers. 34. What is Brownian diffusion? The primary deposition mechanism for very SMALL particles and will deposit DEEP within the lungs. 35. What is gravimetric sedimentation? When aerosol particles settle out of suspension and are deposited due to the pull of gravity. Breath-holding after inhalation increases sedimentation and distribution in the lungs. The greater the mass of a particle, the faster it settles. 36. What is inertial impaction? When aerosol in motion collides with and are deposited onto a surface. The greater the mass and velocity of a moving droplet, the greater the inertia and tendency of that droplet to continue moving along its set path. 37. What is the blow-by technique? It is used if the patient cannot tolerate mask treatment. The aerosol is directed from the nebulizer towards the patients nose and mouth from a distance of several inches from the face. 38. What is the fundamental principle of aerosol deposition? Only a fraction of the emitted aerosol will be inhaled and only a fraction of what is inhaled will make it to the lungs. 39. What is the most commonly prescribed method of aerosol therapy? 40. What is the primary hazard of aerosol drug therapy? An adverse reaction to the medication. 41. What is the relationship between GSD and the range of particle sizes? The greater the GSD, the wider the range of particle sizes and therefore a more dispersed aerosol. 42. What’s the difference between spacers and holding chambers? A spacer is valve-less and just adds distance from the point of discharge to the mouth. A holding chamber has valves for holding the medication. 43. Where should the aerosol generator be placed with IPPV? In the circuit close to the patient’s airway. 44. Why would you prime an MDI? To mix the drug and propellant and to ensure that an adequate dose is provided. 45. Why would you use continuous nebulization? For treatment of refractory bronchospasm. Nebulized albuterol is dosed at 5-20mg/hour. 46. What are the two most common laboratory methods used to measure medical aerosol particle size distribution? Cascade impaction and laser diffraction. 47. What are the three categories of DPIs? (1) Unit-Dose DPI, (2) Multiple unit-dose DPI, and (3) Multiple Dose Drug Reservoir DPI. 48. What is aerosol output? The mass of fluid or drug contained in the aerosol product by a nebulizer. It is the mass of aerosol generated per unit of time. 49. Aerosols occur in nature as what? Pollens, Spores, Dust, Smoke, Fog, and Mist. 50. Aerosol particles can change size as a result of what? Evaporation or hygroscopic water absorption. 51. What is aerosol aging? The process by which an aerosol suspension changes over time. 52. The aim of medical aerosol therapy is to? T deliver a therapeutic dose of the selected agent (drug) to the desired site of action. 53. What is the SPAG? The SPAG was manufactured by ICN Pharmaceuticals specifically for administration of ribavirin (Virazole) to infants with respiratory syncytial virus infection. It incorporates a drying chamber with its own flow control to produce a stable aerosol. 54. What is the baffle? A surface on which large particles impact and fall out of suspension, whereas smaller particles remain in suspension, reducing the size of particles remaining in the aerosol. 55. Before initial use and after storage, every pMDI should be what? They should be primed by shaking and actuating the device to atmosphere one to four times. Without the priming, the initial dose actuated from a new pMDI canister contains less active substance than subsequent actuations. You should waste a single does when it has not been used for 4-6 hours. 56. What are breath-actuated nebulizers? An aerosol device that is responsive to the patient’s inspiratory effort and reduces or eliminates aerosol generation during exhalation. They can generate aerosol only during inspiration. This eliminates the waste of aerosol during exhalation and increases the delivered dose threefold or more over continuous and breath-enhanced nebulizers. 57. What is a Breath-Actuated Pressurized Metered Dose Inhaler? A variation of a pMDI that incorporates a trigger that is activated during inhalation. This trigger reduces the need for the patient or caregiver to coordinate MDI actuation with inhalation. 58. What are Breath-Enhanced Nebulizers? They are nebulizers that entrain room air in direct relationship to the inspiratory flow of the patient. They generate aerosol continuously, using a system of vents and one-way valves to minimize aerosol waste. 59. Breath holding after inhalation of an aerosol does what? It increases the residence time for the particles in the lung and enhances distribution across the lungs and sedimentation. 60. What is Brownian Diffusion? The primary mechanism for deposition of small particles (less than 3um), mainly in the respiratory region where bulk gas flow ceases. 61. What are cascade impactors? They are designed to collect aerosols of different size ranges on a series of stages or plates. 62. The CDC recommends that nebulizers should be what? They should be cleaned and disinfected, or rinsed with sterile water, and air-dried between uses. 63. What are Chlorofluorocarbons (CFCs)? They are gaseous chemical compounds that were originally used to power metered dose inhalers but have been phased out of use. 64. What is the process of cleaning holding chambers and spacers? They should be cleaned regularly, typically monthly, as recommended by the manufacturer. Use of dilute liquid dishwashing soap, with or without rinsing, and allowing to air dry are recommended. 65. Clinical efficacy varies according to what? It varies according to both patient technique and device design. For these reasons, the best approach to aerosol drug therapy is to use an assessment-based protocol that emphasizes individually tailored therapy modified according to patient response. 66. Cold air and high-density aerosols can cause what? Reactive bronchospasm and increased airway resistance. 67. What are the concerns in the use of disposable nebulizers with compressors at home? Possible degradation of the performance of the plastic device over multiple uses. 68. What is Continuous Drug Delivery? When nebulization occurs over extended periods. It is where the aerosol particle connects or lands to the body. 70 What are the determinants of deposition? Particle size, inspiratory flow rate, flow pattern, respiratory rate, inhaled volume, ratio of inspiration time to expiratory time, and breath holding. 71. DPIs should not be used for what? They should not be used for the management of acute bronchospasm. 72. Droplet size and nebulization time are inversely proportional to gas flow through the jet? The higher the flow of gas to the nebulizer, the smaller the particle size generated, and the shorter is the time required for nebulization of the full dose. 73. Drugs for nebulization that escape from the nebulizer into the atmosphere or are exhaled by the patient can be inhaled by who? They can be inhaled by anyone in the vicinity of the treatment. The risk imposed by this environmental exposure is clear and is associated with a range of drugs and patients with infectious disease. Pentamidine and ribavirin were associated with health risks to health care providers even when used in conjunction with filters on exhalation ports of nebulizers, containment and scavenger systems, and high-efficiency particulate air (HEPA) filter hoods and ventilation systems. 74. What is a Dry Powder Inhaler (DPI)? Typically a breath-actuated dosing system. The patient creates the aerosol by drawing air though a dose of finely milled drug powder with sufficient force to disperse and suspend the powder in the air. The dispersion of the powder into respirable particles depends on the creation of turbulent flow in the inhaler. 75. What is turbulent low? Turbulent flow is a function of the ability of the patient to inhale the powder with a sufficiently high inspiratory flow rate. 76. What is an Emitted Dose? The mass of drug leaving the mouthpiece of a nebulizer or inhaler as an aerosol. 77. Exhalation into the device before inspiration can result in what? It can result in the loss of drug delivery to the lungs. 78. Eye irritation is caused by what? An aerosol administered via face mask which causes the drug to be deposited in the eyes. 79. What is a pMDI? It is a pressurized canister that contains the prescribed drug in a volatile propellant combined with a surfactant and dispersing agent. It is used to administer bronchodilators, anticholinergics, and steroids. They are easy to use but are commonly misused. 80. Poor patient response to bronchodilator therapy often occurs because what? An inadequate amount of drug reaches the airway. To determine the “best” dose for patients with moderate obstruction, the respiratory therapist should conduct a dose-response titration. 81. What is a potential problem with continuous bronchodilator therapy (CBT)? An increase in drug concentration can be adversely given. Patients receiving CBT needs close monitoring for signs of drug toxicity (e.g., tachycardia and tremor). 82. The precise amount of drugs delivered to the patient’s airways can be measured in terms of what? The patient’s clinical response to aerosol drug therapy including the desired therapeutic effects and any unwanted adverse effects. 83. A preliminary assessment should balance what? 84. The primary hazard of aerosol drug therapy is what? An adverse reaction to the medication being administered. Other hazards include infection, airway reactivity, systemic effects of bland aerosols, and drug reconcentration. Shaking the device and releasing one or more sprays into the air when the pMDI is new or has not been used for a while. It is done to mix the drug and the propellant required to provide an adequate dose. 86. What procedures are used to help reduce contamination and infection associated with respiratory care equipment? Nebulizers should be sterilized between patients, nebulizers should frequently be replaced with disinfected or sterile units or rinsed with sterile water (not tap water) and air dried every 24 hours. 87. What is a propellant? Something that propels or provides thrust, as the propellant in a metered dose inhaler. 88. A reservoir on the expiratory limb of the nebulizer does what? 89. What is residual drug volume? Also known as dead volume, it is the medication that remains in the SVN after the device stops generating aerosol and “runs dry.” The residual volume of a 3-ml dose can range from 0.5 to more than 2.2 ml, which can be more than two-thirds of the total dose. Residual volume also depends on the position of the SVN. 90. What is the respirable mass? It is the proportion of aerosolized drug of the proper particle size to reach the lower respiratory tract. 91. Restlessness, diaphoresis, and tachycardia also may indicate what? Severity of airway obstruction but must not be confused with bronchodilator overdose. 92. What is the risk for caregivers and bystanders when administering aerosol drug therapy? They are at risk of hazards as a result of exposure to secondhand aerosol drugs. It occurs when aerosol particles settle out of suspension and are deposited owing to gravity. The greater mass of the particle, the faster it settles. 94. A simple albuterol dose-response titration involves what? It involves giving an initial 4 puffs (90 mcg/puff) at 1-minute intervals through a pMDI with a holding chamber. After 5 minutes, if airway obstruction is not relieved, the respiratory therapist gives 1 puff per minute until symptoms are relieved, heart rate increases to more than 20 beats/min, tremors increase, or 12 puffs are delivered. The best dose is the dose that provides maximum relief of symptoms and the highest PEFR without side effects. 95. What are Small volume nebulizers (SVNs)? They are most commonly used for medical aerosol therapy and hold 5 to 20 ml of medication. 96. Small volume USNs have been promoted for administration of a wide variety of formulations ranging from what? Bronchodilators to anti-inflammatory agents and antibiotics. 97. Sole dependence on tests of expiratory airflow for assessing patient response to therapy is? It is unwise because not all patients can perform these maneuvers. Other components of patient assessment useful in evaluating bronchodilator therapy include patient interviewing and observation, measurement of vital signs, auscultation, blood gas analysis, and oximetry. 98. What is a spacer? A spacer is a simple valve-less extension device that adds distance between the MDI outlet and the patient’s mouth. This distance allows the aerosol plume to expand and the propellants to evaporate before the medication reaches the oropharynx. 99. Spacers and valved holding chambers are what? They are MDI accessory devices designed to reduce both oropharyngeal deposition and the need for hand-breath coordination. All spacers add distance between the MDI and the mouth, reducing the initial forward velocity of the MDI droplets. It also helps to reduce foul taste of the medication. 100. Spontaneous breathing in all patients, including pediatric and neonatal patients, results in what? It results in greater deposition of aerosol from an SVN than occurs with positive pressure breaths (e.g., intermittent positive pressure ventilation). This mode of ventilation reduces aerosol deposition more than 30% compared with the effect of spontaneously inhaled aerosols. 101. What is the technique for using an SVN? Slow inspiratory flow optimizes SVN aerosol deposition. Deep breathing and breath holding during SVN therapy do little to enhance deposition over normal tidal breathing. As long as the patient is mouth breathing, there is little difference in clinical response between therapy given by mouthpiece and therapy given by mask. 102. What are the three categories of nebulizers? (1) Pneumatic jet nebulizers, (2) USNs, and (3) VM nebulizers. 103. What is the recommended timing of actuation intervals? Manufacturers recommended 30 seconds to 1 minute between actuations. Very rapid actuations of multiple puffs per breath reduces inhaled drug per puff. 104. In order to avoid an opportunistic oral yeast infection, the patient should do what? They should rinse the mouth after steroid use. 105. What are two specific problems that are associated with SPAG use to deliver ribavirin? (1) Caregiver exposure to the drug aerosol, and (2) Drug precipitation can jam breathing valves or occlude the ventilator circuit. 106. A typical SVN is powered by what? It is powered by a high-pressure stream of gas directed through a restricted orifice (the jet). The gas stream leaving the jet passes by the opening of a capillary tube immersed in solution. Because it produces low lateral pressure at the outlet, the high jet velocity draws the liquid up the capillary tube and into the gas stream, where it is sheared into filaments of liquid that break up into droplets. 107. What are unit-dose DPIs? They dispense individual doses of the drug from punctured gelatin capsules. 108. The USN uses a piezoelectric crystal to do what? To generate an aerosol. The crystal transducer converts an electrical signal into high-frequency (1.2- to 2.4-MHz) acoustic vibrations. These vibrations are focused in the liquid above the transducer, where they disrupt the surface and create oscillation waves. If the frequency of the signal is high enough and its amplitude strong enough, the oscillation waves form a standing wave that generates a geyser of droplets that break free as fine aerosol particles. 109. Valved holding chambers are used for what? They are used to protect the patient from poor hand-breath coordination, with exhaled gas venting to the atmosphere, allowing aerosol to remain in the chamber available to be inhaled with the next breath. They allow infants, small children, and adults who cannot control their breathing pattern to be treated effectively with MDIs. 110. What is Volume Mean Diameter (VMD)? The median diameter of an aerosol particle measured in units of volume. 111. Well-designed baffling systems decrease what? They decrease both the MMAD (size) and the GSD (range of sizes) of the generated aerosol. 112. When ribavirin or pentamidine is given, the treatment is provided where? It is provided in a private room. The room should be equipped for negative pressure ventilation with adequate air exchanges (at least six per hour) to clear the room of residual aerosols before the next treatment. HEPA filters should be used to filter room or tent exhaust, or the aerosol should be scavenged to the outside. 113. When used in conjunction with high-frequency oscillatory ventilation, administration of albuterol sulfate via a VM nebulizer placed between the ventilator circuit and the patient airway has been reported to what? To deliver greater than 10% of the dose to both infants and adults. A pMDI with an adapter placed immediately proximal to the endotracheal tube achieved similar results in adult patients ventilated via high-frequency oscillatory ventilation. 114. Where aerosol particles are deposited in the respiratory tract depends on what? It depends on their size, shape, and motion and on the physical characteristics of the airways. Key mechanisms causing aerosol deposition include inertial impaction, sedimentation, and Brownian diffusion. 115. With continuous or bias flow through the ventilator circuit, the delivery is reduced how? It is reduced as the flow increases, whereas placement of a VM nebulizer near the ventilator increases delivery. 116. Without a dose counter, there is no viable method to determine what? To determine the remaining drug in a MDI other than manually keeping a log of every dose taken. 117. What are some of the advantages of using an MDI? They are inexpensive, light, compact, resistant to moisture, They provide a quick delivery of drugs, as well as precise and consistent doses. They are available with most anti-asthmatic drugs. 118. What are some of the disadvantages of an MDI? Some patients have difficulty in the coordination of activation and inspiration. It can be time-consuming to teach. There is also the cold-freon effect, which is the inability to continue to breathe when the propellant is released into mouth. 119. What patients cannot use a DPI? Children under the age of 5 and patients unable to generate a high air flow. They also may not work as well in high humidity environments. 120. When should an MDI be activated for a ventilator patient? Coordinate firing the MDI with the beginning of the ventilator inspiration. 121. When using an MDI, how much time should you allow between actuations? Allow 30 to 60 seconds. 122. How does an atomizer differ from an SVN? Atomizers don’t have baffles. They are usually powered by a hand-squeezed bulb. Because the particles are larger, the drug deposits in the upper airway. You might deliver a local anesthetic through an atomizer prior to bronchoscopy. 123. DPIs require a high inspiration flow of what? 124. What are some of the Advantages of a spacer? No need to activate coordination with inspiration, Increases drug deposition in the lungs, Reduces drug deposition in the mouth, Can be used in children with a face mask, and Decreases the incidence of oral thrush. 125. What are some of the characteristics of Jet Nebulizer? Cools during operation, provides a small aerosol particle size, and is less expensive. 126. In what part of the lung would you like to deposit beta-adrenergic bronchodilator drugs? 127. What is the “blow-by” technique that is used with infants? Blow-by is directing the mist by the baby’s mouth and nose without direct application to the face via a mask. It is not very effective. 128. SVN dosages should be adjusted when delivered to an intubated patient by what amount? Give 2 to 5 times the normal dose. 129. What is the optimal flow rate and amount of solution to put in an SVN? 130. What are of the characteristics of ultrasound nebulizers? Heats up during operation, Larger aerosol particles, More expensive, and Less noise. 131. What class of inhaled drugs requires that you always use a spacer or chamber? Corticosteroids to reduce oropharyngeal deposition. 132. What is the aerosol output an ultra sound nebulizer is capable of delivering? 133. What are some of the hazards of aerosol therapy? Bronchospasm, Over-hydration, Overheating of inspired gases, Delivery of contaminated aerosol, and Tubing condensation draining into the airway. 134. Why is particle size so important in aerosol therapy? The ability of aerosols to travel through the air, enter the airways, and deposit in the lung is largely based on particle size. 135. Which of the following best defines an aerosol? A suspension of liquid or solid particles in a gas. 136. What devices generate therapeutic aerosols? 137. The mass of aerosol particles produced by a nebulizer in a given unit time best describes which quality of the aerosol? 138. Which of the following describes the mass of drug leaving the mouthpiece of a nebulizer as aerosol? 139. Which of the following is a common method to measure aerosol particle size? 140. What measure is used to identify the particle diameter, which corresponds to the most typical settling behavior of an aerosol? Mean mass aerodynamic diameter (MMAD). 141. What is the retention of aerosol particles resulting from contact with respiratory tract mucosa called? 142. What is the primary mechanism for deposition of large, high mass particles (greater than 5 um) in the respiratory tract? 143. What will increase aerosol deposition by inertial impaction? Variable or irregular passages and turbulent gas flow. 144. Where do most aerosol particles in the 5-10 um range deposit? 145. Where do most aerosol particles in the 1-5 um range deposit? 146. What term describes the primary mechanism for deposition of small particles? 147. Where do most aerosol particles that are less than 3 um deposit? 148. What is the process by which aerosol suspension changes over time? 149. What is the primary hazard of aerosol drug therapy? 150. To minimize risk of infection associated with aerosol drug therapy, what should you do? Sterilize the nebulizers between patients, Frequently replace in-use units, and rinse nebulizers with sterile water. 151. To monitor a patient for the possibility of reactive bronchospasm during aerosol drug therapy what should u do? Measure pre and post peak flow and/or %forced expiratory volume in 1 second, Auscultate for adventitious breath sounds, Observe patient’s response, and Communicate with the patient during therapy. 152. What is the preferred method for delivering bronchodilators to spontaneously breathing and intubated, ventilated patients? 153. Immediately after firing, the aerosol produced by most MDI’s are about how large? 154. Most of the spray generated by the majority of MDI’s consist of what? 155. When fired inside the mouth what % of the drug dose delivered by a simple MDI deposits in the oropharynx? 156. Before inspiration and actuation of an MDI, the patient should exhale to which of the following? 157. To ensure delivery of proper drug dosage with an MDI, which of the following must be done first? The canister should be warmed to hand or body temperature and the canister should be vigorously shaken. 158. What groups of patients are most likely to have difficulty using a simple MDI inhaler for aerosol drug therapy? Patients that are in acute distress, infants and young children, and elderly persons. 159. What is a potential limitation of flow triggered MDI devices? The high flows necessary for actuation. 160. For which patients would you recommend against using a flow triggered MDI as the sole bronchodilator delivery system? A patient that is likely to develop acute severe bronchospasm. 161. The key difference between an MDI holding chamber and a spacer is that the holding chamber incorporates what? 162. What device would you select to deliver an aerosolized bronchodilator to a young child? MDI, holding chamber, and mask. 163. Proper use of a dry powder inhaler requires that the patient be able to do what? Generate inspiratory flows of 60 L/min or higher. 164. What device depends the patient’s inspiratory effort to dispense the dose? 165. For what patient groups is the DPI for bronchodilator administration NOT recommended? Infants and children under 5, patient’s with an acute bronchospastic episode. 166. Exhalation into what device can result in loss of drug delivery? 167. SVN output drops after lowering the patient’s bed while giving a treatment but there is 3 mL of solution still left in reservoir. How can you correct this problem? Reposition the patient so that the SVN is more upright. 168. What happens as the pressure for flow delivered thru a SVN gets higher? The treatment time becomes shorter, Particle size becomes smaller, Aerosol output becomes greater. 169. Normally, when using a 50-psi flowmeter to drive a SVN, you set the flow at what? 170. To minimize a patient’s infection risk between drug treatment’s with an SVN, what would you do? Rinse the SVN with sterile water; air dry. 171. The physician has ordered an antiviral agent ribavirin (Virazole) to be administered by aerosol to an infant with bronchiolitis. Which device would you select? SPAG – Small particle aerosol generator. 172. What serious problems are associated with the delivery of Virazole using the SPAG? Caregiver exposure to drug aerosol, drug precipitation in ventilator circuits. 173. For maintenance administration of bronchodilators to adult patients with adequate inspiratory flow, which aerosol devices would u recommend? DPI, and MDI with holding chamber. 174. What aerosol drug delivery system would you recommend against using with a toddler or small child? 175. On average, what % of an aerosol drug delivery device’s output actually deposits in the lungs? 177. What would you recommend as initial therapy for a patient admitted to ER with acute airway obstruction? Assess dose response of MDI albuterol (up to 12 puffs), and Provide up to 3 SVN treatment’s with albuterol every 20 minutes. Blood levels of the bronchodilator agent. 179. What is false about the use of PEFR in assessing pts response to bronchodilator therapy? PEFR is the standard for determining bronchodilator response. 180. When assessing a patient’s response to bronchodilator therapy, you notice a decrease in wheezing accompanied by an overall decrease in breath sounds. What’s most likely the cause of this? 181. An asthmatic in severe distress is admitted to ER. After full assessment and obtaining a pre-treatment baseline, you start the patient on albuterol with an SVN. When should you stop documentation and the treatment? When the patient’s symptoms are relieved or when the PEFR/FEV1 in 1 second exceeds 70% of their personal best. 182. What factor is most crucial in developing an effective program of aerosol drug self-administration in an adult patient requiring maintenance bronchodilator therapy? 183. What is the best way to confirm that an asthmatic patient can properly self-manage a newly prescribed aerosol drug therapy? Have the patient provide a repeat or return demonstration. 184. The physician orders continuous bronchodilator therapy with 1:200 albuterol for an asthma patient at a dosage of 20 mg/hr. How much 1:200 albuterol will be needed for the 1st hour of the treatment? 185. Indications of an adverse drug response during continuous bronchodilator therapy include all except? 186. When using a chamber style adapter with an MDI to deliver a bronchodilator to a patient receiving mechanical ventilation, with what would you coordinate MDI firing? And that wraps up our study guide on Aerosol Drug Therapy. These practice questions should do a great job of teaching you everything you need to know in Egan’s Chapter 39. But as I always say, repetition is key and it never hurts to go back and read the entire chapter and that’s something I always recommend for most students. Either way, definitely make sure to keep going through these practice questions again and again until the information sticks. Thank you so much for reading and as always, breathe easy my friend.